Hanoi native Nguyen Kim Quang (born 1958) is one of Vietnam’s leading lacquer artists. Painting with lacquer is a centuries-old tradition that was first introduced by the Chinese for the making of handicrafts and decorative items and developed into a uniquely Vietnamese art form in the last century. 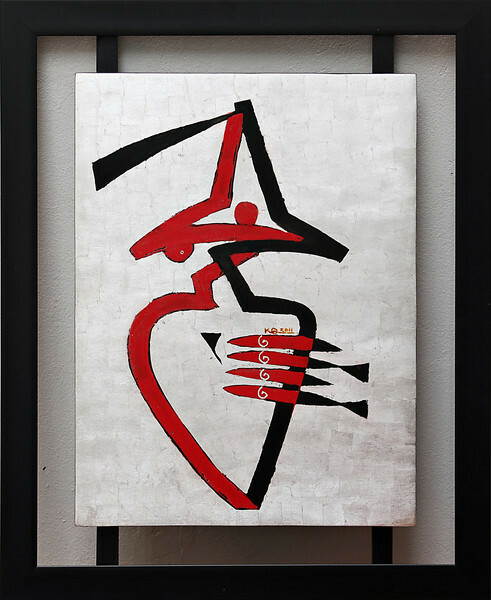 Unlike most conventional lacquer art, Kim Quang’s work is abstract and minimalist. His art is full of symbolic messages that are often anchored in his Buddhist beliefs. Through art, Kim Quang communicates the core values that govern his life: faith, love, peace and harmony. He has had exhibitions in Vietnam, Hong Kong, Belgium, the United States, Switzerland, Singapore, Thailand and Australia. Nguyen Kim Quang,Happiness, 2011. Lacquer, 20 X 28 in.